Whenever I’ve visited a foreign country, I’ve always made an effort to meet and hang out with the locals, rather than remaining in the tourist realm. When visiting Martinique, my husband and I had a great deal of fun speaking French, though neither one of us really knew how. When visiting the Dominican Republic, we rented a place in town and hung out with the locals, rather than remain on some compound. This did result in a passport almost getting stolen, a close call with a knife wielding mugger, and a great deal of difficulty driving on construction ridden roads that were unlit at night. But those inherent dangers far outweighed the notion of visiting a country without getting to know it. Having been here for just about three months, you’d think I’ve met and gotten to know many Dubliners. Well, think again. I am acquainted with just three Dubliners. I’ve been to pubs and many nights of listening to traditional Irish music. In those situations I am more of an observer, and haven’t gotten to personally know the people I’ve met. My academic bubble doesn’t offer many chances to meet the natives. There are four new PhD students this year at Trinity: me, Giovanni from Italy, Kai from Hong Kong and Lindsey from Tennessee. Our research supervisor, Evangelia, is from Greece. Her Greek accent often makes it difficult to understand her. In one of the classes I am auditing, there is a woman from Malasia, another from Canada, and a man from England. There is a man from Limerick and another who is a native Dubliner. The Dubliner is a shy fellow; I’ve only heard him speak twice. There is also a woman from Washington D.C. When I learned this I was very surprised, because she speaks with a brogue. When I told this to Evangelia, she asked with a measure of alarm whether she herself had developed an Irish accent. “Absolutely not,” I told her, and she looked relieved. I have met emigrants who have been living here for many years: the Brazilian hosts of the AirBnb in Temple Bar and an Indian man, Shiva, who runs the corner store, for example. They help me to get to know Dublin and share thoughts about being an emigrant, but I am no closer to getting a grasp of the accent and the culture through their friendship. Most of his conversation is interrupted with, “Y’know wha’ I mean?,” with the ’t’ at the end of ‘what’ clipped off. Often, if we hang out for a few hours, his way of speaking slips back into New York-ese. As much as I want to get a hold of understanding the Irish accent, I seek comfort in the familiarity of Brew’s New York way of speaking. So I like it when he allows it to come back. I moved to Dublin during the summer. School had not yet started, and I found it difficult to meet people. 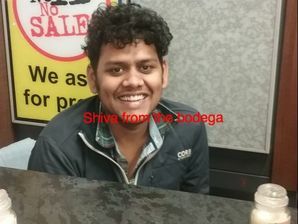 I befriended Shiva from the corner store (in New York we’d say ‘bodega’). Starved for human contact and conversation, I would invent reasons to go to his store just to chat. I’d go to his store for milk, even though I had milk at home. He grew curious about me when I began asking if he sold regular household items like a corkscrew or screwdriver. After that we started to exchange stories and share photos of our families. We share facts about our native countries. The conversations are always fascinating. This morning I went into his store, and he scolded me for not having stopped in for a few days. I told him I’d had nothing to buy. Occasionally his brother, Manu, is in the store visiting. At those times, both Manu and Shiva will assault me with the terrible US news topic of the day as soon as I enter the store. “Health insurance!” one of them will shout as I open the door. They want me to explain away all the ills of the United States. Of course, I am unable to do that, though I try to be as clear as possible. But the gulf of misunderstanding is evident in the questions they ask. Shiva seems to think that everyone in America owns a gun, though I’ve repeatedly told him it’s not true. One day after a rather lengthy discussion of the price of education and insurance as well the gun laws in the U.S., Manu looked quite exasperated. I told him that it was where I was born, where my family is, and that it was my home. This did nothing to change the look on his puzzled face. From my balcony I listen to the people below, hoping to catch some of what they are saying. Other than construction workers from the nearby building site, the people who come down my little side street are usually either lost tourists or local drunks or druggies, looking for a place away from the cops. I can understand the Italian and German tourists far more easily than the junkies. To me it seems like they are speaking Swedish. Then I’ll hear an English word like “Wha’ever” and realize it’s English. These junkies are of course not my friends, nor will they ever be. But it is one more angle of the local culture that I’m getting to know.